In case you are a fan of the ABC-Show “Castle” you might have wondered, which watch it is, that Detective Kate Beckett is wearing. 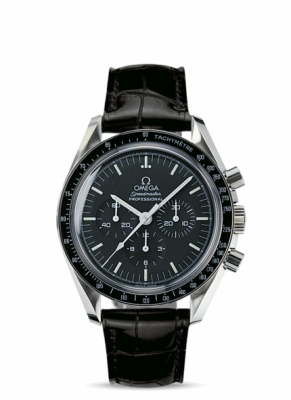 It is a Omega Speedmaster Moonwatch Professional 42mm. It is the watch of her father and it is of nostalgic value to her. The Speedmaster is one of the most iconic timepieces watchmaker Omega has to offer. Having been a part of all six lunar missions, the legendary Speedmaster is an impressive representation of the brand’s adventurous pioneering spirit. This watch was worn during the first American spacewalk and was the first watch worn by an astronaut walking on the moon during the Apollo 11 mission. This Omega Speedmaster Professional “Moonwatch” features a black dial covered by a hesalite crystal and graced by a small seconds sub-dial, 30-minute recorder and 12-hour recorder along with a central chronograph hand. The black bezel, with its tachymetric scale, is mounted on a 42 mm stainless steel case and presented on a black leather strap. At the heart of this chronograph is Omega’s mechanical calibre 1861, the famous manual-winding movement that was worn on the moon. It comes with a rhodium-plated finish and a power-reserve of 48 hours. The Moonwatch is also water resistant up to 50 metres. Clearly, the Omega Speedmaster Professional “Moonwatch” is a legendary piece. Its calibre has proven its worth and reliability under the hardest circumstances possible, which are unlikely to happen here on earth. It is made to last and comes with an extraordinary history. That it appears in a popular TV-Show therefore becomes a minor matter. But a nice one, we have to admit.